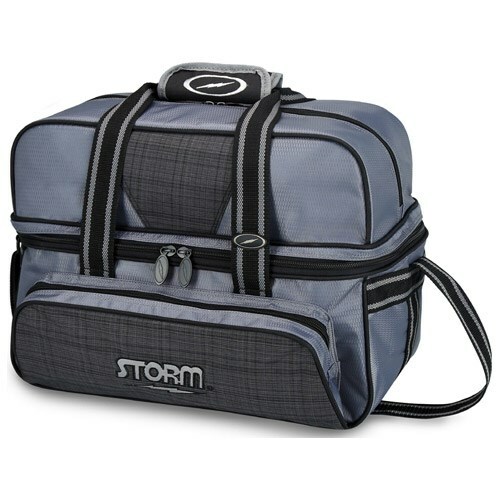 The Storm 2 Ball Deluxe Tote Charcoal Plaid/Grey/Black holds 2 bowling balls, shoes, and accessories. This bag is a good match for anyone that only has two balls or someone who just wants a smaller bag to make quick practice trips to the lanes. Dimensions: W: 16" x D: 10" x H 14"
Too small. No ball separator. Very light weight. Probably will give it away. Maybe use it as a gym bag. The closeout totes will be the same as the new bags. They will have the foam ball cups. This is a tote bag and totes do not have wheels. Due to the time it takes to produce the Storm 2 Ball Deluxe Tote Charcoal Plaid/Grey/Black ball it will ship in immediately. We cannot ship this ball outside the United States.